3B Umpire Gabe Morales ejected Cubs LF Kyle Schwarber (strike three swinging call) in the bottom of the 9th inning of the Angels-Cubs game. With two out and two on (R2, R3), Schwarber attempted to check his swing on a 3-2 knuckle curve from Angels pitcher Cody Allen, ruled a ball by HP Umpire Jerry Meals and a swinging third strike on appeal by 3B Umpire Morales. Play was reviewed and adjudicated by the UEFL Appeals Board (9-0-0), the call was correct. At the time of the ejection, the game was over. The Angels ultimately won the contest, 6-5. This is Gabe Morales (47)'s first ejection of 2019. Gabe Morales now has 0 points in the UEFL Standings (-4 Prev + 2 MLB + 2 Correct Call = 0). Crew Chief Jerry Meals now has -5 points in Crew Division (-6 Previous + 1 Correct Call = -5). This is the 17th ejection report of the 2019 MLB regular season. This is the 11th player ejection of 2019. Prior to ejection, Schwarber was 0-4 (2 SO) in the contest. 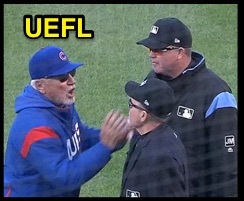 This is Chicago's 2nd ejection of 2019, T-2nd in the NL Central (CIN 4; CHC, PIT 2; MIL, STL 1). This is Kyle Schwarber's first ejection since May 20, 2018 (John Tumpane; QOC = Y [Balls/Strikes]). This is Gabe Morales' first ejection since Sept 3, 2018 (Joe Maddon; QOC = Y [Balls/Strikes]).